The compelling story of two outsiders striving to find their place in an unforgiving world. Drifters in search of work, George and his simple-minded friend Lennie have nothing in the world except each other and a dream–a dream that one day they will have some land of their own. Eventually, they find work on a ranch in California’s Salinas Valley, but their hopes are doomed, as Lennie, struggling against extreme cruelty, misunderstanding and feelings of jealousy, becomes a victim of his own strength. 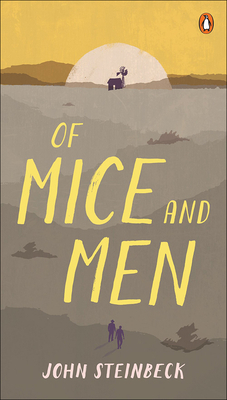 Tackling universal themes such as the friendship of a shared vision, and giving voice to America’s lonely and dispossessed, Of Mice and Men has proved one of Steinbeck’s most popular works. 1 – Have you ever had a dream you tried to achieve? How would you feel if your dream was accidentally derailed by a friend? 2 – How did you feel about the characters George and Lennie? Do you feel frustrated by Lennie’s action or sympathetic? 3 – Do the characters “deserve” their dream? Does “deserving” a dream mean it should happen, either in this book or in life, or are there other factors?